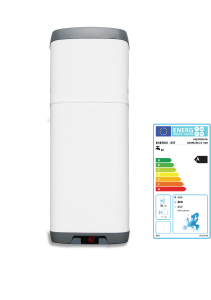 LVP bring to the market the option of heating your hot water with a renewable energy that doesn’t require a panel being put on the roof. The Domestic Hot Water Heat-Pump works in a similar fashion to the thermodynamic panel in that it utilises air temperature to vaporise and compress a gas to create heat which then transfers to the hot water. This ensures that while you don’t have the added benefit of having a solar collector on your roof, you are still guaranteed hot water 365 days of the year from a reliable source without the high running costs associated with some other technologies. There are two separate four inch ducts that are connected to the cylinder which are normally installed to pull heat from the air from the outside of the building. As the gas will vaporise at an extremely low temperature, this will still ensure that the domestic hot water heat-pump will function down to roughly -5°C, providing you with ample hot water. In-fact, in some premises, it is possible to pull hot air from inside the building should you have an excessive heat in parts of the house. We have found that this can work extremely well in premises where there is a lot of wasted or unwanted heat, take for example a small commercial kitchen. The domestic Hot water Heat-Pump can be a great option, but it won’t be suitable in every application. We have found it to be a fantastic option in areas where we cannot put a panel on the roof or in commercial spaces. The one downside to this over the thermodynamic solar, is that you don’t get any benefit from solar gain with a domestic hot water heat-pump. The system does have a compressor that has a small running cost. Due to the nature of the system, the compressor tends to be slightly larger than the thermodynamic one, can therefore be slightly noisier. It is more suited in a house if it can be fitted in a plant room, or ideal in small commercial premises. It is always advisable to have a site survey to ascertain which technology will suit your needs best. To Arrange A Call Back Now! Your Details Are Safe With Us. We Will Never Pass Them On To A Third Party! @TomEHalpin Great to hear, but there is an urgent need for a drastic increase in numbers of fast charge points.